I'm not sure if it's because I don't pull them when I find them, but they seem to be all over the yard this year. And tall. Goodness, they are at least 3 1/2 feet tall with thick, sturdy stems which wouldn't yield even if I wanted to yank them out of the ground, which I don't. 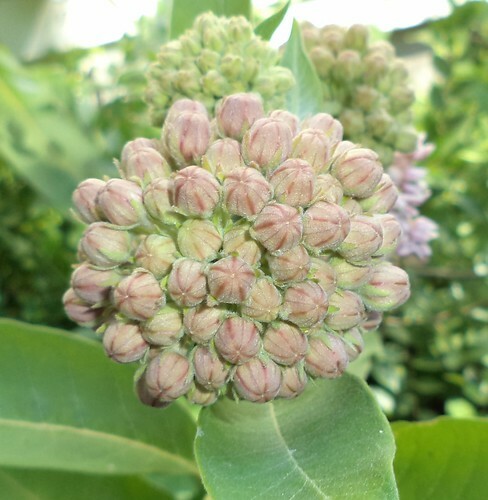 This year, in particular, I noticed the scent of the milkweed. I probably noticed it before but because there are so many plants in the yard and quite a few up next to the house, the scent is particularly apparent this year. Spicy is the only way to describe it. I had to actually stop and think, "What is that smell?" when it wafted in the bedroom windows last week. There is a sweetness to the scent, but it is quite spicy. I wonder if that's how the butterfly knows where the plant is? Or perhaps, its ultraviolet color spectrum, something our eyes cannot process, causes the insect to see the plant, to know this is a milkweed and that it will have the nectar the butterfly requires. Soon, I will see these bright red bugs amongst the flower heads. I don't know what those are. 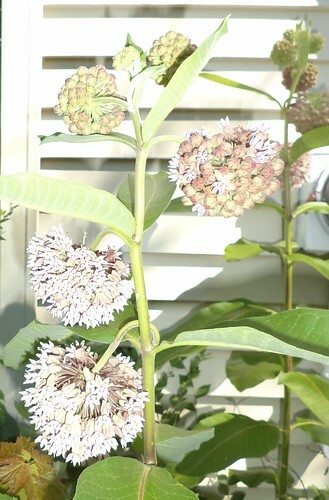 I only see them on the milkweeds and only amongst the flowers. I've never seen the butterfly cocoon anywhere in the yard. I have such an abundance of milkweed but never the cocoons or caterpillars. That's the part I really would like to see. Years ago, on one of the microphone stands for a piece of office equipment, a cocoon was left. I kept it in the backyard, watching every day for signs that it would hatch. Of course, it hatched while I was gone for a few days on vacation. 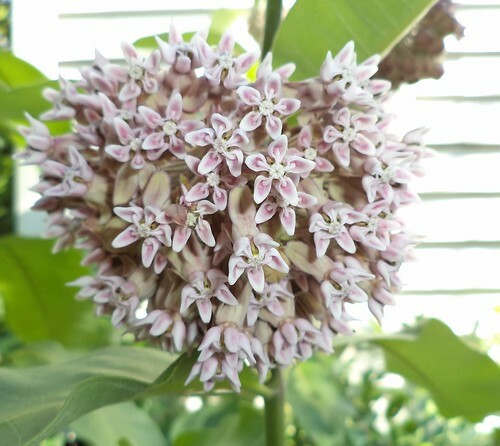 I always think the flower ball of a milkweed plant looks like plastic. I'm hopeful the sheer amount of food in my yard will entice some butterflies to linger. That would certainly be the benefit to the benign neglect of some sections of my yard.